You can easily boost your income each month by using apps to make money. Better still, the ones I recommend are completely FREE to download! Before I looked further into money making apps, I thought I would need to spend hours upon hours each day on my phone in order to make any money. Of course, you’ll have to give up a little bit of time but I’m talking about a few minutes here and there, not hours. 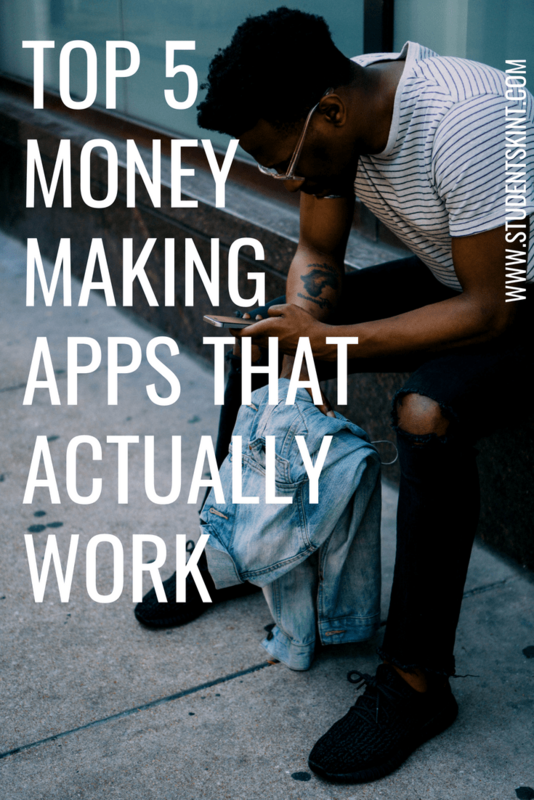 Most of these apps provide opportunities to make more money when you’re out and about, so there’s no need to be cooped up indoors. Note: These apps aren’t going to make you rich. It’ll be enough to maybe cover your mobile contract or a subscription (or two) for the month. It’s one of those ‘the more effort you put in, the more you’ll get out’ things but you can easily make at least £10 per month. That’s at the very least. Job Spotter is an app by Indeed which allows you to make money (Amazon gift cards) from job vacancy signs. It’s as simple as that! Firstly, download the app and ensure your location is turned on when you’re out and about. When you see a job vacancy sign, go up to it. Open the app and take a photo of the vacancy sign and front of the business. Et voila, you’ll get money! There’s no minimum cash out amount so if you want to cash out the money each time or save it up to get a larger Amazon gift card is up to you. Top tip: this app is great around Christmastime because there’s loads of temporary Christmas vacancies being advertised. Better yet, the money you earn from this app can go towards buying Christmas presents on Amazon! I’ve spoken about this app in my make extra money from receipts blog post so check that out if you want to find out more and learn a couple of tricks to make sure you get the most out of it. Essentially, you earn ‘Tokens’ which becomes real money just by taking photos of your shopping receipts. I’m sure you have receipts lying around each week/month so Shoppix is one of those money making apps that actually work because you don’t need to put much effort in at all! Vypr is an app where you answer quick questions called ‘Steers’ (usually about groceries and food) and when you’ve reached 100% you can cash in your points for a £5 PayPal gift card. Each Steer takes between 5 – 30 seconds to answer. I promised you these apps are quick. You’ll tend to get more Steers when you’re near or in a grocery store so turn your location on and you’ll be racking up points in no time! This is a survey and tasks app, you can be asked to do things like answering a short survey or downloading an app and reaching the first level. Curious Cat tells you upfront the estimated time it will take to complete surveys so you can judge whether your time is worth the amount of points (1 point = 1p) you’ll be getting. I avoid surveys that take longer than 7 minutes because after that, I’m usually putting in more time than it’s worth but it’s completely up to you. The minimum payout threshold is 100 points (£1) which is easy to reach and payments go into your PayPal account. eBay and Depop are the apps that can make you the biggest amount of money each week/month. I have a blog post on make money from your unwanted things which goes more in depth about selling and how to boost your profits. I can’t put a figure on the money you can make using these because it depends on what you sell and if it sells. You can sell a t-shirt for £5 or vintage collector’s items for £5,000 it really depends! Have you tried any of the apps I’ve suggested? Leave a comment below and tell me how you got on. Hi. Congrats on your new blog. I have not tried any of the apps you mentioned above but I am interested in Shoppix as it sounds super easy. I’m always looking for easy ways to earn some side cash. Thanks for the tips. Take care. Hi Lisa. Thanks for having a read of my post, definitely get started with these to make some extra money!